At the Central Station, Departure Gallery, there is a pharmacy, open every day 24 hours on 24. Friuli street 30, open Monday to Friday from 8.30am to 4.00pm. By virtue of its geographical position Milan offers a continental climate, with cold winters and hot humid summers. In other seasons, clear days alternate periods of rainfall. 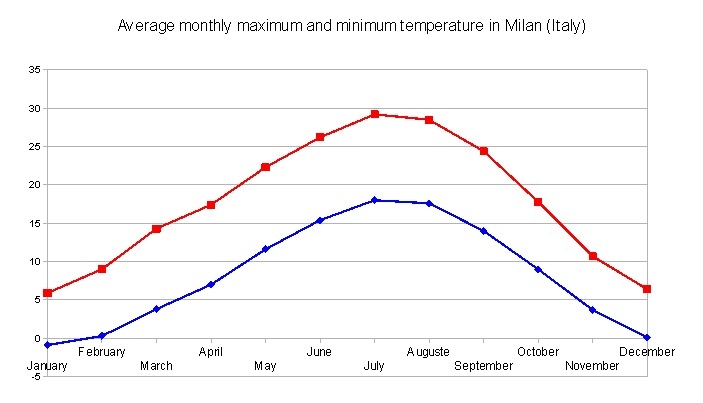 Average monthly temperatures are shown in the figure. In winter, especially in the most peripheral parts of the city, the fog can form, although the phenomenon has reduced in recent years, with the reduction of air pollution. While in Milan the temperatures rarely reach extreme values ?? (below -5 ° C in winter and above 35 ° C in summer) moisture increases both the sense of cold in winter, and, above all, that of hot in Summer. 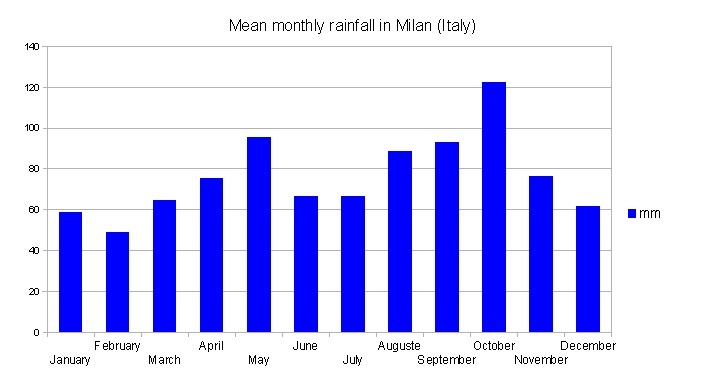 Particularly in spring, but also in autumn it is possible to have almost continuous rain for various days. 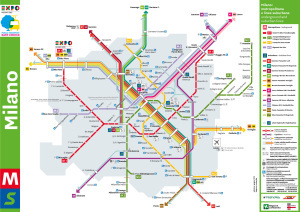 Urban tickets allow you to use all the urban ATM network with the urban leg of the intercity routes, and the urban rail lines of Trenordand the 'Passante Ferroviario' (Urban Railway Network). 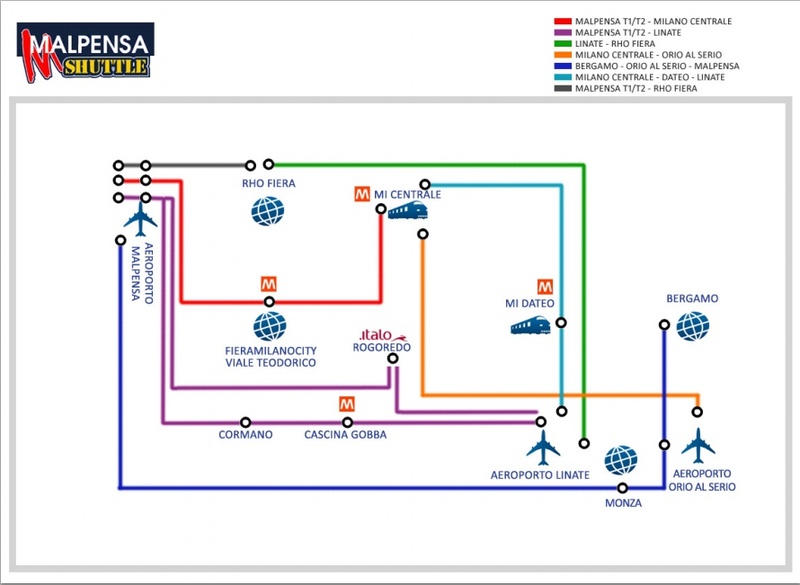 Valid for two journeys only from Milan to Rho Fiera station on the underground Line 1 and viceversa, lasting a maximum of 105 minutes. For every journey, you can use the metro only one time. 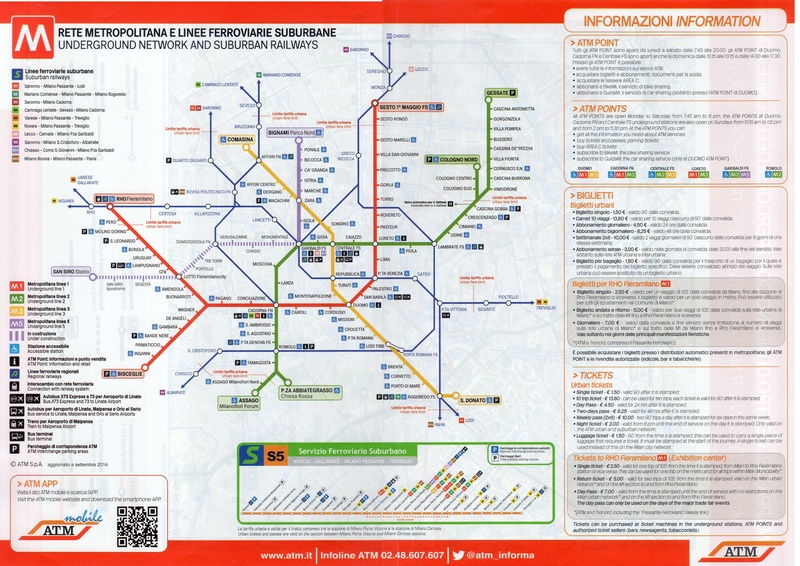 The ticket is valid in Milan Municipality area too, including the urban rail lines of Trenord and the Passante ferroviario (Urban Railway Network). Valid for one journey from Milan to Rho Fiera station on the underground Line 1 or viceversa, lasting a maximum of 105 minutes. For every journey, you can use the metro only one time. The ticket is valid in Milan Municipality area too, including the urban rail lines of Trenord and the Passante ferroviario (Urban Railway Network). 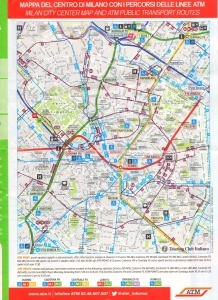 The ticket is valid from the Municipality of Milan, to the Sesto FS station on the Line 1 and Cologno Nord or Bussero on Line 2 of the underground network. Its valid in all the Middle Area of the overground network too (go to Cumulative Tickets for more information). Valid from the time of stamping to the end of service, from Rho Fiera station on the underground Line 1 to Milan and viceversa. Available only during exhibitions. The Regional (R) Lines link the whole Lombardy Region through a huge railway network of almost 2.000 km. 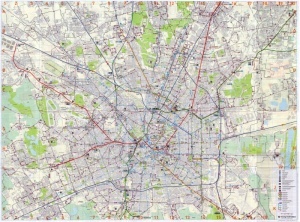 The S Lines link the Milan hinterland with the city centre, via the Passante underground railway and along the overground rail lines. 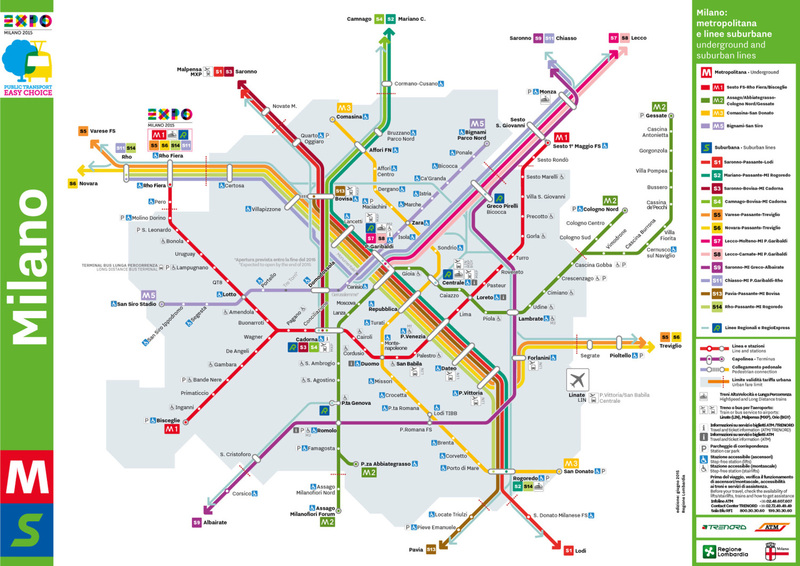 The journey of many commuters who travel to and from Milan is thus made much easier, providing the city with an extensive underground service. The journeys - scheduled every 30 minutes, throughout the year, seven days a week, from 6 am to 12 pm - branch off from the centre of Milan for over 30 km to Novara, Varese, Saronno, Como, Mariano Comense, Camnago-Lentate, Lecco, Seregno, Treviglio, Lodi and Albairate, with several intermediate stops. The rail link, employs modern vehicles, with baggage storage areas between compartments, lower beds to facilitate wheelchair access and a sound system for messages in Italian and English. Some train rides intermediate stops. Rates: Linate / Fiera € 40, Malpensa / Linate € 85.Rates: Linate / Fiera € 40, Malpensa / Linate € 85. You may arrive at Bergamo railway station by train and then take the ATB service, which, in only 10 minutes, will bring you to Orio al Serio airport. Visit www.trenitalia.com for trains time table.